So for the last couple of days I've been talking about living finishes and patinas and how they fit into the world of plumbing fixtures. To review; copper, bronze and brass as reactive metals --they change color and texture as they react to their environment. That change is called a patina. A patina is what corrosion's called when it's desirable. Think about it. The patina silver develops is called tarnish and it's a badge of shame. Copper does the same thing and people call it verdigris and prize it. Interesting. Now, in addition to those naturally-occurring color and texture changes, the word patina is also used to describe virtually any color applied to metal. Although that word tends to be reserved for colors that mimic a naturally-occurring patina. Make sense? what are you supposed to do when you have a budget? Enter our friends at Kohler. This is a $300 lavatory faucet, the Fairfax single control, and it's being shown here in Kohler's finish, brushed bronze. Now, when Kohler refers to one of their fixtures as having a brushed bronze finish, they are talking about its color. 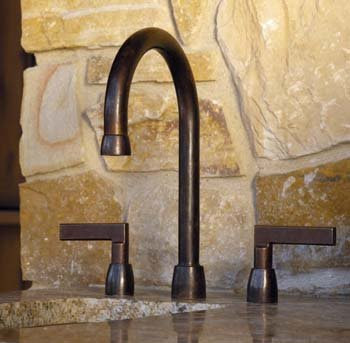 When Rocky Mountain Hardware talks about brushed bronze, they're talking as much about the composition of the faucet as they are the color of it. 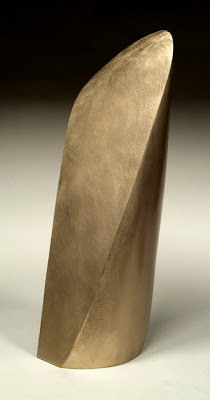 True bronze made by somebody like Rocky Mountain is a labor-intensive process and bronze is a notoriously finicky metal. 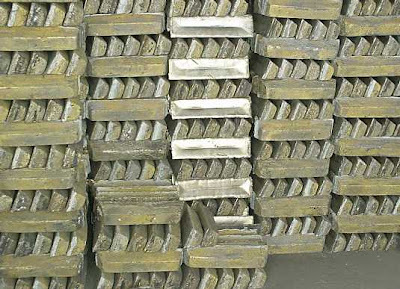 Not only that, Rocky mountain is a bronze foundry and they make their bronze fixtures and hardware using sand casting and the lost wax method. Surely you remember the lost wax method from grade school social studies. That's right, Rocky Mountain does things the way the ancient Babylonians did and they charge accordingly. I'm not knocking Rocky Mountain for a second here either, seeing the fruits of their labor makes me weak in the knees. It's really beautiful stuff and it's intended to be a once in a lifetime purchase. But love it though I do, I can't afford to throw thousands of dollars around on lavatory faucets and that's where our friends at Kohler come in again. Kohler doesn't make that brushed bronze Fairfield single lever lavatory using methods handed down from the ancient Babylonians. But what they do make is beautiful enough. 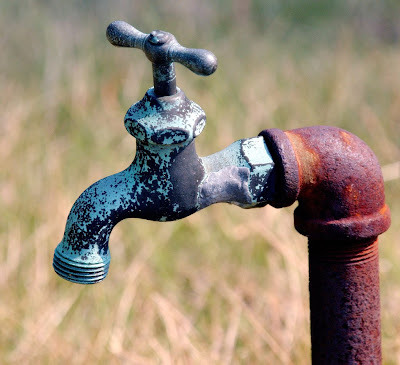 Large scale plumbing manufacturers cast a faucet from a base metal; usually brass, zinc or a combination of the two. The base metal faucet is polished and then electroplated. Once it's electroplated they then apply a patina and then finally, they seal the color with a clear top coat. As soon as that fixture leaves Kohler's production floor it's locked in time. It will not continue to change. It won't evolve into another color. In fact, it's guaranteed not to change for life. here's Kohler's answer to that patina, oil-rubbed bronze. Again, what they're describing is the color. The two faucets pictured up there are separated by production methods, a slight variance in color and about 1500 dollars. The real bronze fixture will continue to change over time and the bronze-colored fixture is guaranteed never to change. Confused? Don't be. Let the price tags be your guide. 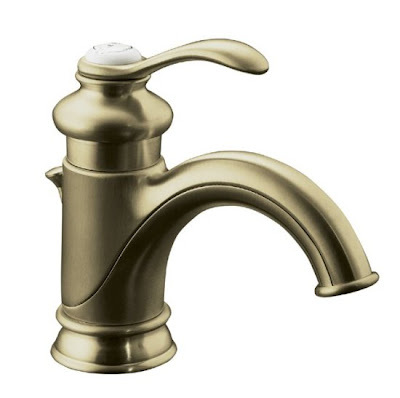 If a lavatory faucet costs over a thousand dollars, chances are good that it's made from copper, bronze or brass and will have a living finish. 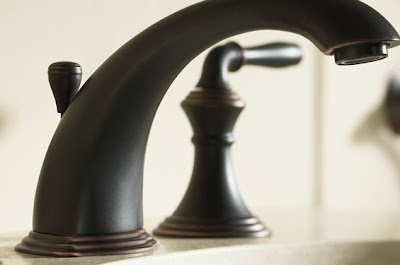 If faucet costs under $500, it will not have a living finish and it will look factory fresh for life. So Monday I'll delve into the exciting world of nickel, chrome and steel. I'm already giddy with anticipation. I think I'm giddy as well. I like nickel and chrome right now, depending. Hey, it's my pleasure. What a great find and I have that crazy broad at Decorno to thank. Somehow, I don't think she'd mind being called a broad. But you have a great blog my friend, it's a pleasure to read. Keep it up! Paul - extremely interesting, particularly the information about Rocky Mountain (funny how you wrote about their processes, too). Thanks! Victoria, thanks for checking in and thanks for the compliments. You two have an interesting blog and I've been following it for the last couple of days. I'm going to add a link to DesignTies to my blogroll today. Keep checking back.